Hi I have Acoustica mixcraft 8.1 I have had this software for a minute and has always proved to be suitable in my music process. I have recently moved my software and updated to my current mixcraft 8.1 to my new pc - hp pavilon. It’s perfect as it converts to a tablet and makes the process very efficient. The problem lies in rendering. Once I finish the project it always sounds very flat as if the blasted with eqs and treble rising. Something I didn’t have problems with before? Any help? Check your audio settings on the Pavilion to make sure any audio "enhancments" are disabled. Many personal computers have this set to on by default, and it will result in changes to the sound of your playback using media players etc. Also make sure the quality settings when you render, are sufficient. 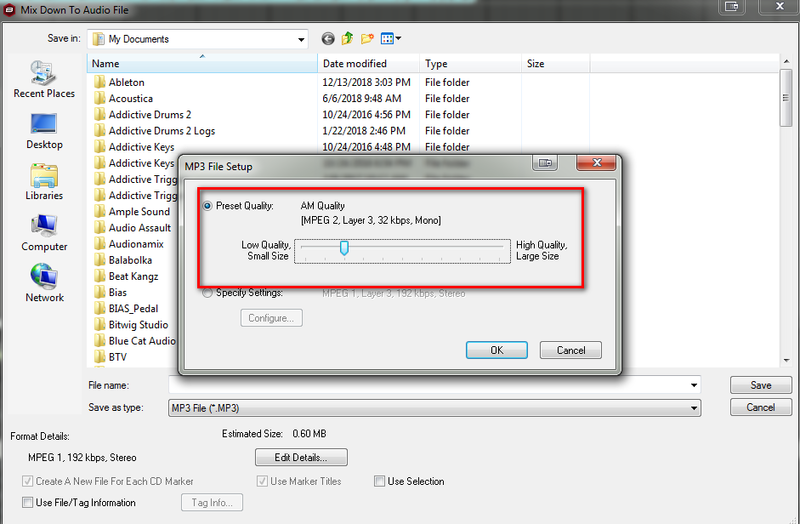 If you render an mp3 for example, if you choose low quality such as shown below, it will sound tinny.